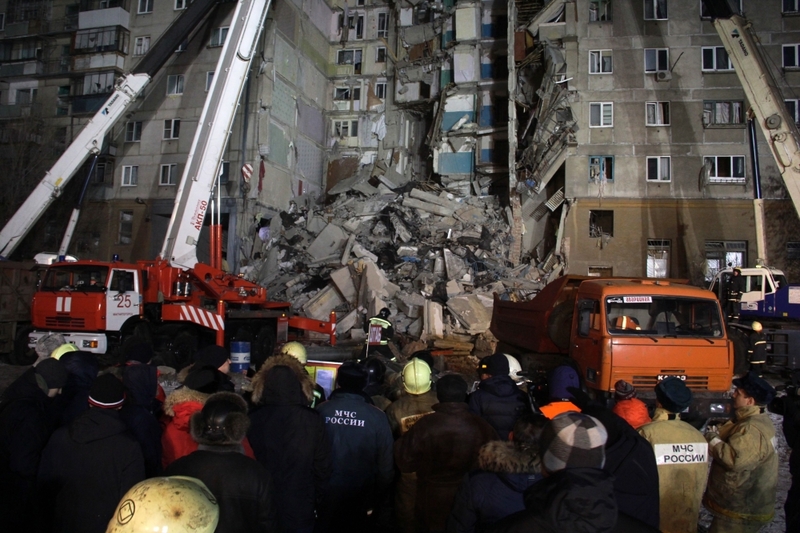 Russia’s emergencies ministry says the search of the concrete rubble from a partially collapsed apartment building has ended and the number of deaths stands at 39. The ministry declared the operation by hundreds of rescue workers completed Thursday, three-and-a-half days after a section of a 10-story apartment block collapsed in an explosion. A 10-month-old boy pulled from the wreckage in the city of Magnitorgorsk on Tuesday was the only person found alive in the debris. He is being treated in Moscow for serious injuries and was described as being in stable condition on Thursday. 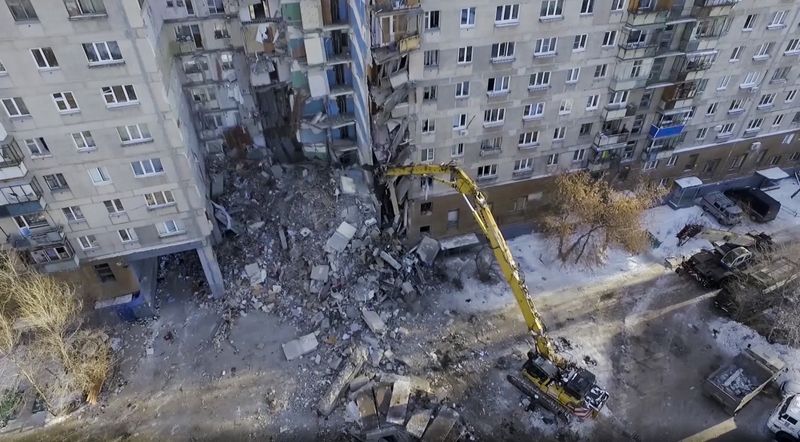 The death toll from the collapse of a Russian apartment building has risen to 37 after more bodies were discovered by crews searching the huge pile of concrete rubble. 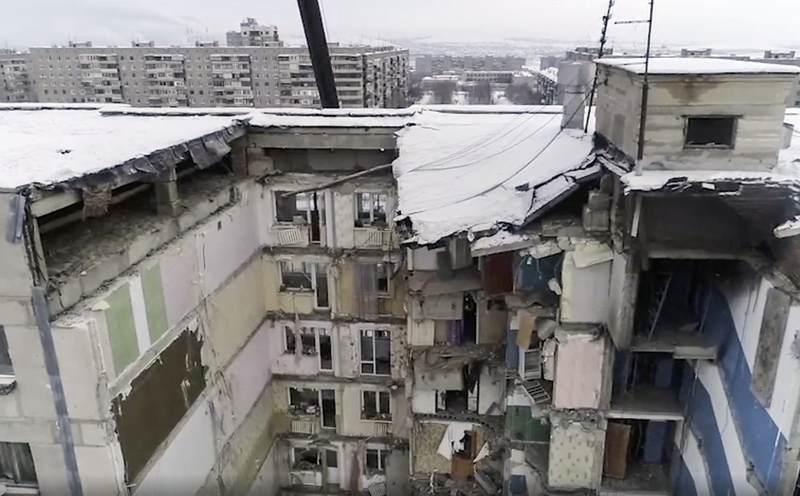 State news agency Tass cited an emergencies ministry official on Thursday as saying four people who lived in the collapsed section of the building in Magnitogorsk remain unaccounted for. The collapse on Monday followed an explosion that officials say likely was caused by a gas leak. An 11-month-old boy was extracted from the wreckage alive on Tuesday and was flown to Moscow for treatment of injuries including frostbite. Nighttime temperatures in the city 1,400 kilometers (870 miles) southeast of Moscow have fallen to about minus 20 degrees Celsius (minus 4 Fahrenheit). 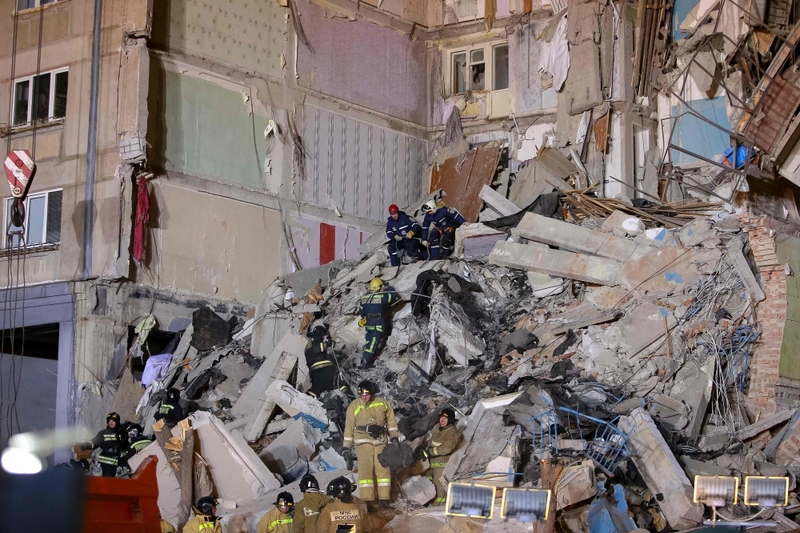 Rescuers hunted for survivors Wednesday in the rubble of a Russian apartment building hit by a New Year's Eve gas explosion, but found only bodies as the number of confirmed dead rose to 18. Nearly two dozen people were still missing following the explosion, which destroyed 35 apartments in the high-rise in the city of Magnitogorsk in the Ural mountains. Braving temperatures that fell as low as minus 27 degrees Celsius (minus 16 degrees Fahrenheit), rescue workers were combing through mangled concrete and metal. Their efforts were given a boost on Tuesday when a 10-month-old baby boy was found alive and reunited with his mother. But hope was starting to fade of finding many more survivors. 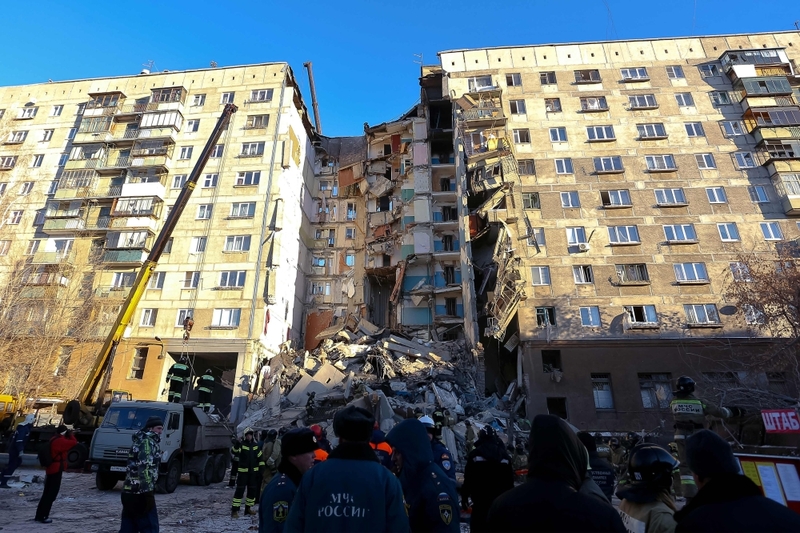 The emergency situations ministry said in a statement that as of 12:15 Moscow time (0915 GMT) the bodies of 18 people, including two children, had been recovered from the partly collapsed building. Six people, including two children, had been rescued and 23 people were still missing. "Work at the scene is continuing," it said, noting that 800 square metres of debris - loaded into 50 dump trucks - had been cleared from the site in the last 24 hours. The explosion, believed to have been caused by a gas leak, tore through the nine-storey building in Magnitogorsk, an industrial town nearly 1,700 kilometres (1,050 miles) east of Moscow, in the early hours of Monday. Witnesses described a "wave of fire" from the explosion and said the blast was strong enough to shatter windows in nearby buildings. The Soviet-era apartment block was home to about 1,100 people and the blast left dozens homeless over the New Year - the biggest holiday of the year in Russia. At least 14 people are confirmed dead from the New Year's Eve explosion at a high-rise apartment building in the Russian city of Magnitogorsk, news agencies reported Wednesday. 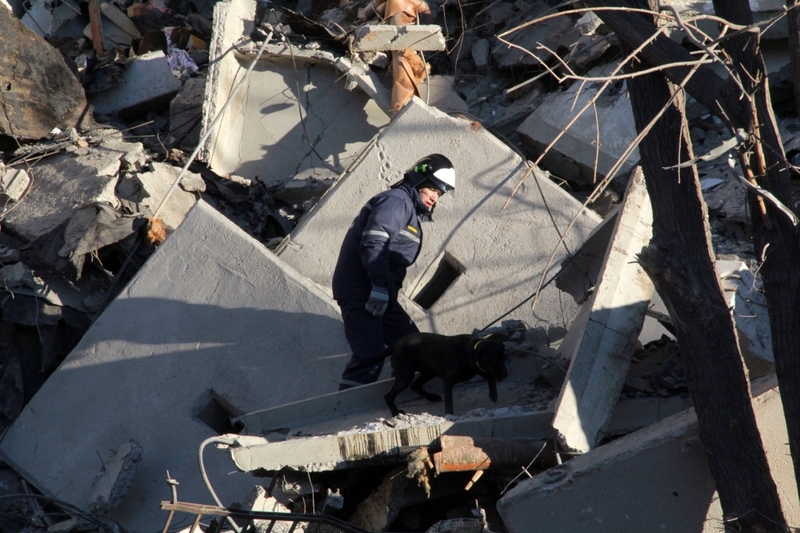 Citing local emergency officials, the RIA Novosti, TASS and Interfax news agencies said the number of dead had risen to 14 as rescuers pulled more bodies from the rubble of the collapsed building.